Offering you a complete choice of products which include vertical retractable window. Net size range 1600mm W x 2500mm H max. Matching with the changing and growing needs of customers, we offer spring loaded Verticular Retractable Window, Sun slits, narrow kitchen windows. It retrieves 100% natural light and fresh air. We offer innovative screening solution for windows, doors, French doors or large opening pleated screens. The products of our company are decorative and can be operated effortlessly by children’s and elders. 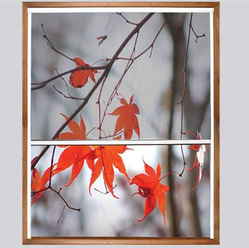 There is no retracting force to open or close in our Vertical Retractable Window. Looking for Vertical Retractable Window ?